The great war epic of Western literature, translated by acclaimed classicist Robert Fagles, and featured in the Netflix series The OA Dating to the ninth century B.C., Homer's timeless poem still vividly conveys the horror and heroism of men and gods wrestling with towering emotions and battling amidst devastation and destruction, as it moves inexorably to the wrenching, tragic conclusion of the Trojan War. 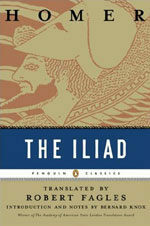 Renowned classicist Bernard Knox observes in his superb introduction that although the violence of the Iliad is grim and relentless, it coexists with both images of civilized life and a poignant yearning for peace. Combining the skills of a poet and scholar, Robert Fagles, winner of the PEN/Ralph Manheim Medal for Translation and a 1996 Academy Award in Literature from the American Academy of Arts and Letters, brings the energy of contemporary language to this enduring heroic epic. He maintains the drive and metric music of Homer's poetry, and evokes the impact and nuance of the Iliad's mesmerizing repeated phrases in what Peter Levi calls "an astonishing performance." This Penguin Classics Deluxe edition also features French flaps and deckle-edged paper. For more than seventy years, Penguin has been the leading publisher of classic literature in the English-speaking world. With more than 1,700 titles, Penguin Classics represents a global bookshelf of the best works throughout history and across genres and disciplines. Readers trust the series to provide authoritative texts enhanced by introductions and notes by distinguished scholars and contemporary authors, as well as up-to-date translations by award-winning translators.